The Spoon Making Master Class is a two day course in which students will produce a silver spoon. 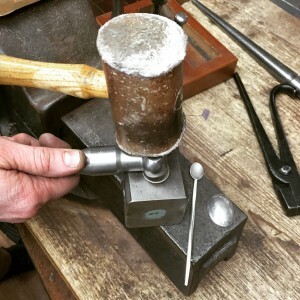 Students will learn traditional silversmithing techniques, and will walk away with technical knowledge as well as a shiny new piece. Perfect for a christening present, Christmas, wedding or anniversary present. A significant piece for a significant occasion. A maximum of nine places are available on this course, with a minimum of six participants required for the course to run. Full Payment is required to secure a place. We can take card payments over the phone – please note the cost of the day is not refundable. Silver is available on the day and costs extra. Silver for a spoon can cost anywhere from £100 to £150 depending on size and weight. Once payment is received we will send an email confirming your place on the course – just let us know if you would like a place by calling 01582 833800.